Back in 2011 I did a post highlighting 5 tips for using props and visual aids when delivering a presentation. It’s an exercise we perform in the Dale Carnegie Course to help participants make effective use of physical props when presenting their ideas in front of a group. Recently I did an update to this post for a fellow instructor in Modesto. It includes how these ideas relate to your delivery when you use PowerPoint in your presentation. In addition to these 5 tips, here’s another point that needs highlighting. When you are presenting your ideas, realize that you are the message. It doesn’t matter if you are performing a marketing presentation in front of a client, a sales demonstration, or an engineering review. You are the message and the message must address your audience’s needs. Only then should you begin tailoring the PowerPoint slide deck and planning for props to accentuate your message. I’ve seen too many capable speakers put all their effort into designing a beautiful presentation with no legs because they didn’t discover what the audience wanted first. Thinking this was an easy process question, I outlined that I would start asking the client questions about the audience, what they were looking for, how much time would be involved, etc. I’m sure that was the expedient solution. However, in my time as an instructor and speaker, I’ve discovered that you need to know your audience when delivering a presentation. When you are delivering a sales presentation, you REALLY need to know your audience! Every year, some research group conducts a sales survey with customers to get their feedback on the sales experience. These surveys always identify the biggest problem customers have with sales reps is the sales reps’ inability to stop talking and listen to what the client wants. If you are about to present your solution to a group of executives, you don’t have the right to feel confident simply because you’ve been practicing that generic sales presentation from marketing. You may be able to deliver the presentation, but you won’t be speaking to your audience’s interests. I’ve seen presenters deliver well-rehearsed presentations to indifferent audiences because they weren’t addressing what their audience wanted. As a result, the presentations always flopped. When you are developing your presentation, take a page from the digital marketing playbook. Create an image of your audience and then identify their wants, needs, interests and desires. Or, better yet, ask the person bringing you in about the audience you’ll be speaking to. Then, design your message to address those wants, needs, interests and desires. Only after you know what your audience is looking for can you create your message. And only then can you begin to incorporate your presentation features like your PowerPoint presentation and your physical props. Don’t put the cart before the horse. 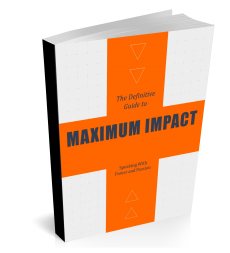 Tailor your message to what your audience wants and you’ll get maximum impact for your effort. 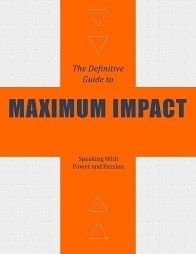 For additional ideas on public speaking and presentations, download my latest ebook collaboration, Maximum Impact.